India has been traditionally been a poor traveling team. The team has hardly won overseas even with some legends in the team in the past. India has only won 40 tests overseas out of 247 games with a W/L ratio of 0.377. India’s overseas record post Ganguly era is impressive. India has won 27 tests overseas since November 10, 2000 (The first time Ganguly captained in tests) out of 91 tests since that period. The W/L ratio since that period is very respectable 0.75. So if we take that period out we have 13 test wins overseas in 156 games at a W/L ratio of 0.185 which is extremely poor record. The Ganguly era basically made the overall test record slightly better than the horrible record we had prior to that. It is not like the India had a poor test team before that. India lost all those tests with legends in the team like Sunil Gavaskar, Bedi, Prasanna, Kapil Dev, GR Vishwanath, Sachin Tendulkar, Rahul Dravid, Amarnath, Venkatraghavan, Mohd Azharuddin etc. The Indian team was mentally weak and was not able to turn good performances into wins overseas and was mostly blow away by the opposition. Now all the experts from the past are expecting this young team who are nowhere near the capability of the teams of the past to suddenly start hammering teams overseas. Let us look at the current Indian team. Except for Murali Vijay, Ajinkya Rahane and Virat Kohli, the rest of the batting order is still up for debate. The bowling has been extremely inconsistent with a young brigade led by very inconsistent Ishant Sharma. The spin attack hasn’t played too much overseas (Ashwin has played a grand total of 9 tests outside Asia). The attack on Kohli and this young team by past players and media for not winning overseas seems little over the top. I agree that the fans want Indian team to win overseas and compete but again we need to give this team a chance. Almost all the players played their first games overseas in 2013-14 and gave a decent account of themselves, much better than some legends did in the past. Sourav Ganguly started kind of a golden era of Indian cricket but again he had much better team at his disposal. Sourav and Virat are similar captains, both are aggressive in your face leaders but Virat Kohli is developing a core while Sourav already had a core available to him. The task for Sourav was to channelize and guide a group of legends to perform as a team and start winning games overseas but the task for Kohli is much tougher. He does not have legends in his team but has few good players who are still finding their feet at this level. He does not have a batting line up consisting of Virender Sehwag, Sachin Tendulkar, Rahul Dravid, Sourav Ganguly and VVS Laxman. He does not have a bowling attack of Zaheer Khan, Javagal Srinath, and Anil Kumble at his disposal to turn this around immediately. So the media and experts need to be patient with this young team. There is no reason to crucify this team now. They have just started to gel and perform. They just won a test series in Sri Lanka which even the best of Indian teams were not able to do for 22 years. Sourav Ganguly had a bunch of players who were experienced and were playing in the team for 10-13 years. Srinath, Kumble and Sachin were playing for a long time and except for Sehwag the rest of the team at least was 5 years behind them. So let us not hammer this team now. The ex-players should understand this better than anyone. I can agree if the media is doing this as they like to sensationalize things but the former players who have played at the highest level should know better. I can understand the frustration of Virat Kohli and he is completely justified to feel aggrieved. The Indian teams of the past won home games like how Virat and his team is doing now and except for post Ganguly era performed worse than the current team outside home. Expecting a bunch of players who hardly have any experience to suddenly turn that horrible overseas record overnight is ridiculous. I hope that we support this young team and back them and give them some time to figure themselves out and I am sure we will see the results getting better when they travel overseas again. This is a young team with a young leader after legends exited the game. We can see how badly South Africa and Australia played in the sub-continent after their legends left the game so give these players some time and encourage them. No need to throw your own players under the bus for winning home games the same way the teams of the past won their games at home. It was 1991 and the game was India vs. Pakistan at Sharjah. I had never watched a cricket game before and I thought that Sachin was this young boy who just appeared with Kapil Dev in the Boost advertisement. Pakistan had batted first and score 257 in 50 overs and India was chasing a difficult score against a great bowling lineup. India had a great start but lost their way in the middle when this young boy walks in and plays a beautiful innings getting India close to the target. I still remember Sachin hammering Mushtaq Ahmed for two consecutive sixes and getting out trying to go for the third. That was the day I got glued to the game of cricket and the reason for the same was the little master. Everyone knew that this young boy is going to be a great player then but even his strongest supporter would not have imagined what this great player went on to achieve in his 24 year career. Sachin Tendulkar gave the Indian fans lots to cheer in a particularly poor decade for Indian cricket. This was the phase where the Indian hopes in every game lay on just his wicket. The opposition knew that and so did every Indian fan. There were lots of fans who would just turn off their televisions as soon as their idol got out. We need to understand that Sachin was still just a young man and to handle that amount of pressure was truly remarkable. I remember he was the only batsman who always looked at home even on the overseas tours when all his fellow team mates struggled to put bat on ball. The brilliant hundred in Perth and the fantastic innings in Johannesburg as a 19 year old were able testimony to the fact. Sachin had amazing composure for a young man and his balance at the crease was phenomenal. He did not have any noticeable weakness and even if he had he had the ability to iron them out before he stepped out to bat again. His child like enthusiasm for the game and his great dedication made him a stand out player of his generation. His achievements are there for everyone to see. In spite of enjoying a god like status in India, he still remains a humble human being. He has achieved everything a cricketer could dream of. The 2011 world cup win for sure completed his cricketing resume and for sure will give him utmost satisfaction. Sachin was also part of the world number 1 test team and his IPL team Mumbai Indians gave him a fitting send off with a CLT20 win. 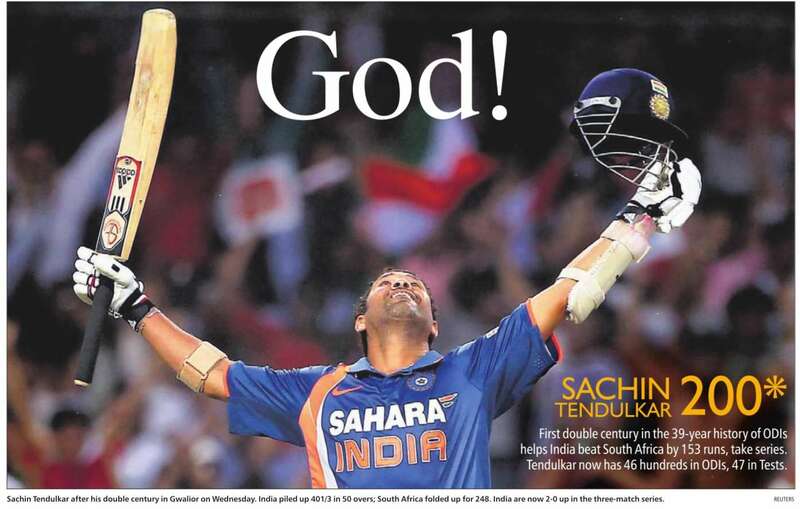 It will be sad to see Sachin go. I have watched Sachin Tendulkar throughout his career and he has been part of my growing up years. As a cricket fan in the 90’s Sachin has given me lots of fond memories which I would always cherish. The brilliant hundred in Benoni, the desert storm innings, his brilliant performance in the 1996 world cup and many more such performances will forever be etched in my memory. Sachin Tendulkar will be sorely missed by every Indian cricket fan. It will be hard to imagine an Indian cricket team without the little master in the lineup. I hope that he has a great farewell in the final two tests he will be part of later next month. I wish Sachin remains attached to the sport in some vicinity, imparting the vast cricketing knowledge he has. Thank You Sachin for all the great memories and as a diehard fan of yours I will for sure miss watching you don the Indian colors again. Virat Kohli is definitely the toast of the nation at the moment. The last few ODI innings of his has for sure cemented his status as one of the premier ODI batsmen in the world. Virat has had brilliant last couple of years in ODI cricket and his elevation to vice-captaincy status at a very young age shows that the selectors see him as a future Indian captain. My first look of Virat was in 2008 Sri Lankan ODI series. The test series for India was absolute dampener and the series was more famous for the emergence of another mystery spinner from Sri Lanka Ajanta Mendis. India was missing experience in the batting order and in the absence of Sachin and Sehwag, Virat was sent to open the innings. Virat showed great grit and stuck to his task admirably well. His stats weren’t earth shattering but it did show the fighting spirit of the youngster. He handled some difficult conditions pretty well and helped India win the ODI series. It was surprising to see that India ignored Virat after that series for almost a year but the youngster took the break into his stride and came back stronger. The break also meant that Virat travelled to Australia to take part in the Emerging players trophy where he was the top scorer for India. Since he made his comeback to the team in 2009, he has been an indispensable member of the Indian squad. With exceptional technique and great concentration Virat Kohli has established himself as one of the finest young players in the world. He has already won lots of ODI games for India batting second and has an enviable average doing so. He has 11 hundreds in just 82 ODI innings, making him the youngest to get to 10 ODI hundred at an impressive average of 50.56. Virat has everything going for him in ODI cricket. Virat Kohli though did not have a smooth sailing in test cricket. In spite of having everything going for him as a player, he did struggle at the test level though. He did not have a great start to his test career but by the end of Australian tour he did find his groove. He was the only Indian to score a test hundred in the Australian series and proved that he did belong at the bigger stage. His two fifties at Perth and a brilliant hundred in Adelaide should give him lots of confidence for more challenges ahead later this year. Even though he has had a great start to his career, his aggressive celebrations and use of expletives too often has got him into trouble with the experts and the media alike. Even though I personally feel that being an aggressive cricketer playing with lots of passion, he does get little carried away which is fine with me. Virat has the talent and performances to pull off such behavior as a brash youngster, similar to another great Ricky Ponting. But Virat needs to keep one thing in mind as such behavior will for sure look great when the team is doing well but will look ugly when the team is struggling. I guess he for sure will learn as he gets older. For now let’s enjoy the success of the genial superstar, India has unearthed once again. I hope that he continues to scale more peaks and helps India to get to the top once again in world cricket. Harbhajan Singh is India’s premier spinner, there are now two ways about it. A veteran of almost 100 tests and over 400 wickets, he is one of the best spinners in the world over the years. When Anil Kumble retired in 2008, Harbhajan was expected to take over the mantle as India’s number 1 spinner but for some reason things did not turn out as expected for the genial sardar. Harbhajan Singh has had a very inconsistent 2-3 years in International cricket and it is hard to determine the cause for the same.